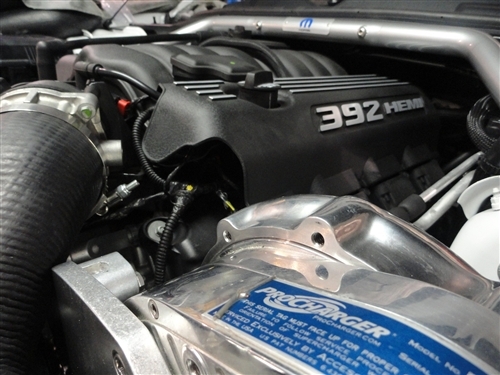 Add 150+ Horsepower to Your 6.4L HEMI Challenger! ProCharger is now shipping their tuner supercharger systems for the 6.4L HEMI-equipped Dodge SRT-8's. With 7 psi of intercooled boost, the HO Intercooled Systems reliably and safely produce 150+ HP gains on stock engines running pump gas. Featuring the coolest charge air temperatures available, the ProCharger system delivers industry-leading power gains and superior engine longevity. Higher boost and power levels are available for modified engines. Features of the HO Intercooled System includes a 3-core, air-to-air intercooler system, and the patented and proven P-1SC-1 self-contained supercharger with available 3-year warranty. Contact HHP to complete your supercharger parts list.